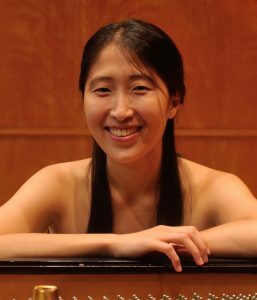 Ms. Dhayoung Yoon was educated in the UK and the USA, having received her bachelor of music degree from Guildhall School of Music and Drama in London, a masters degree from Eastman School of Music in New York, and is currently a Doctor of Musical Arts candidate at the University of Washington. She has performed as a soloist and collaborative artist extensively throughout Korea, the United States and Europe, including prestigious centers in London, Oxford, Vienna, Salzburg, and other Austro-German cities. As an award winner of many prizes, Ms. Yoon also organizes chamber music concerts and enjoys performing with fellow musicians. Ms. Yoon is a passionate teacher with over ten years of experience internationally. During her teaching career in the UK, she worked extensively in the Associated Boards of Royal Schools of Music (ABRSM). Her students always passed with highest distinctions and merits. Dhayoung is a charming and enjoyable person and always seeks to find something unique in her students. This helps to draw upon strength and to better communicate with the individual learner.